Temptations Café opened in October of 2007. Having been long time residents of Scottsdale, Arizona, we have made our home in the neighborhood since 1982. Quite and unassuming, our restaurant brings the charm and menu items found in your favorite cafes of the past. We are sure that your mother would thank us for treating you so well. You can usually find one or both of the owners at the café working most days and always ready for a good discussion. The counter is filled with regulars stopping by for some of the best coffee in town, or to read the paper with breakfast. Breakfast or lunch, your choice, we do it like Mom did and all with a smile. Grab a seat and enjoy. We also have a pet friendly patio. All offerings are superiorly crafted on the premise using nothing but the freshest ingredients. Sandwiches and salads are plentiful, soups rich and tasty. You are free to order any item on the menu since we know that breakfast tastes great all day and so does a bowl of soup, or a burger and fries. Our espresso bar offers the opportunity to try some of our specialty coffee drinks. The staff is creative and knowledgeable in all types of espresso drinks and happy to explain and recommend a hot or iced coffee drink suited just you. We pull our espresso shots from a traditional lever manual espresso machine; this gem pulls a great shot every time. Our coffee is roasted locally by Picasso Espresso. By using a micro roast process, we bring you the freshest bean we could find. Our coffee is blended only for Temptations Café, a perfect blend we call Heavenly Bliss. Take home a half or full pound, whole bean or ground to your liking. We make all our shakes and desserts with Breyers Ice Cream. Discover the joy of real ice cream. Made with rich milk, sweet cream, fine sugar, and other naturally derived ingredients. Check out our restaurant's menu for all the ice cream goodies. 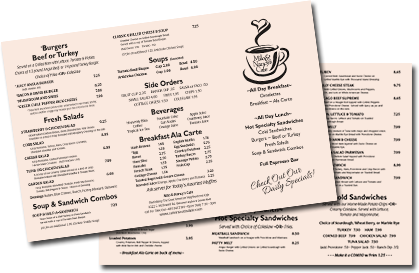 Our Menu consists of tried and true items, as well as daily special to allow for creativity. Our kitchen staff is continuously trying to WOW you with their comfort food recipes. Be sure to stop by and see the different offerings on our weekday specials. Add your email address and we will send you the weekly specials in advance. We look forward to meeting you. 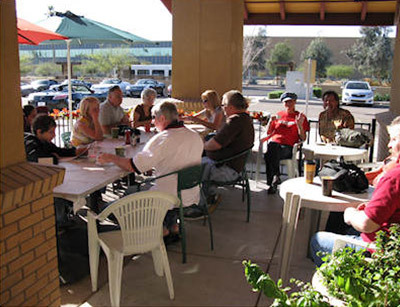 We are proud to be part of the South Scottsdale neighborhood. Temptations' staff is trained to set the standards for customer service. Not only are we here to tempt, we are here to please. Our menu changes frequently to allow for creativity. Be sure to stop by and see the different offerings and specials. 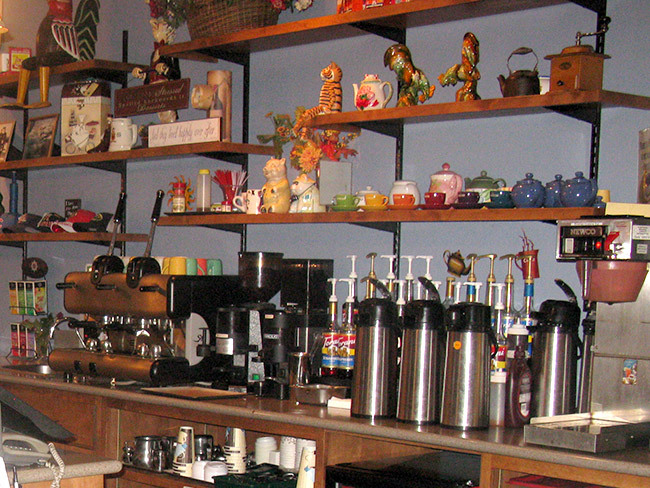 Temptations Café is locally owned and operated. We look forward to meeting you. 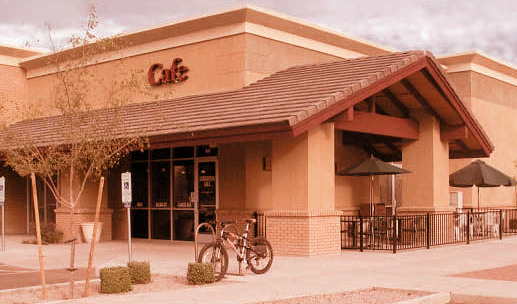 We are proud to be part of South Scottsdale’s, “Renaissance along McDowell Road”, revitalizing the area with investment and employment opportunities. Watch our website as we add daily specials, café news and much more. 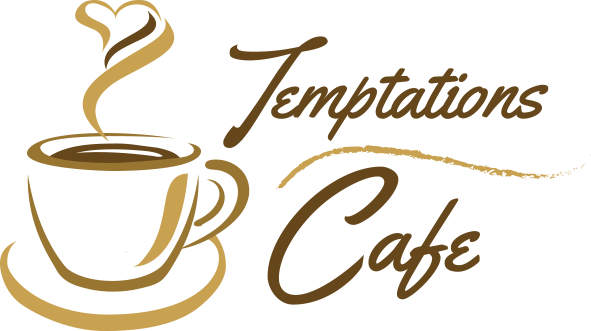 Temptations Café offers a superb variety of coffees. Our beans are roasted locally in small, frequent, supervised batches, bringing you the freshest bean we could find. We are confident you will taste a noticeable difference to some of the larger coffee shops around. Try our own Heavenly Bliss or Bold Truth blends for a great coffee experience. We will be happy to grind your beans. Coffee is available in the half or full pound. We carry a state of the art manual espresso machine. These classic manual espresso machines do not employ an electric pump, instead you pull your shots by hand with the machines lever. Fans of lever espresso machines note a special sweetness in their coffee unattainable in other types of espresso machines. Chocolate and coffee; we've said it before, and we'll say it again: this is a marriage that is heaven on earth. Try our chocolate covered espresso beans for a sweet sensation. Watch the website as we offer a variety of coffee sampling for the true coffee enthusiasts. Receive coupons, information and café events. Arabica (from Ethiopia, known from prehistoric times) beans do best at altitudes of 3,000 to 6,500 feet where the slower growing process concentrates their flavors. They have a much more refined flavor and contain about 1 percent caffeine by weight. Because of its delicate nature, it yields only 1 to 1.5 pounds of green coffee per year. This is the coffee that specialty roasters search for. It accounts for about 75% of the world production. Because the Arabica tree is susceptible to disease, frost, and drought, it requires very careful cultivation with just the right climatic conditions. Arabica has a delicate acidic flavor, a refined aroma and a caramel aftertaste. Coffee lovers judge the quality of a cup of coffee on three criteria – body, aroma and snap. Body: This is the thickness of the brew, the feel of the coffee in your mouth. A comparison would be the difference between a light white bread and a moist whole grain loaf. The heavier the feel, the thicker the brew. Aroma: This is the smell of the coffee. Aroma is more important to those who rely on a sense of smell to enhance taste. Snap: Technically, snap is the acid in a brew. But don’t be put off by snap. Coffee with very little acid will be very bland and perhaps too smooth. Hello, I just wanted to Thank you for a wonderful lunch! Today was my first time at your cafe - I ordered two sandwiches to go along with some cheesecake and I wanted to let you know the sandwiches, tuna melt and your Tuscany, were both delicious! I will be a returning customer. Thanks! Milo & Nancy's Temptations Cafe displays Artwork by Teresa Moore. We look forward to hosting an art display for Ms. Moore in the near future. Artwork by Teresa Moore has appeared in "Miami Rhapsody"
Starring - Antonio Banderas and Mia Farrow. You’ll find them in the corner of a smoky 1920s Paris nightclub, or half-hidden behind the plush red curtain at a New York theater. Teresa Moore’s luminous femme fatales smolder under the stage lights. Their sultry eyes gaze steadily back at you as a smile plays across their full, lacquered mouths. Using a cocktail palette of rich reds, deep blues, and glowing yellows, the artist creates these lush portraits set in a world of dusky glamour. Notice the defined graphic lines, sharp angles and vibrant colors of these works, which accentuate the bold sensuality of these women. Teresa Moore’s work has been exhibited in Paris, Italy, and Spain and collected throughout Europe and the U.S., and is part of the collection at the National Museum of Women in the Arts Library and Archive in Washington DC. 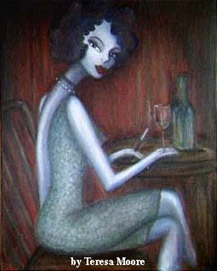 Self-taught and painting mainly with her fingers, Moore creates an atmosphere of nightlife, good yet always alluring. Femmes fatales smolder with long-fingered hands dangling cigarettes and cocktails to their lush lacquered lips. Glamorous and vulnerable, they contemplate a noir netherworld somewhere between dusk and twilight. And these decadent dames get around. Moore’s work is exhibited and collected from New York, Miami, and Chicago to Seattle, New Orleans, Canada, France and Italy. Moore’s fiery independence shows through in these characters, who all seem to have their own checkered pasts.